“Quiet girls who weren't shy, girls who talked in riddles but were never actually rude”—such is the group of girls to which Isabelle Bean belongs. Isabelle makes the other middle school students roll their eyes, and the teachers throw up their hands. She's quirky. She doesn't exactly daydream, but instead tunes into some strange buzzing in the air that no one else hears. Put simply, Isabelle doesn't fit in, and she knows it. Imagine her delight, then, when she falls into an alternate universe. Dowell has a wonderful sense of humor as she upsets Isabelle's expectations. Isabelle keeps thinking she must have some magical powers in this world, and is disappointed that she cannot summon the least sandwich or even an apple as she trudges through the forest alone and hungry. When Isabelle meets the real witch—“not the least bit scary, no evil fumes steaming off her skin, a house filled with sunlight and healing plants”—she is bewildered. Isabelle prefers to think of herself as a changeling, a belief not uncommon in tweens. “If only you could go back to your real home, to your real family, everything would fall into place and you would be loved and admired all hours of the day”—or so you think, points out the narrator, directly addressing the reader. This technique, which Dowell uses throughout the book, has the effect of drawing the reader in closer, and making what's at stake feel important and real. 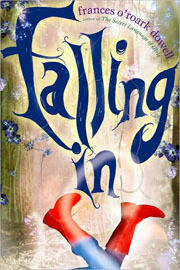 Things aren't falling into place at all for Isabelle, because Falling In is more than a fantasy; Dowell has deftly created a coming-of-age tale for tweens. Although Young Adult literature is a well-defined category for coming-of-age stories, we tend to forget there are earlier transitions. To understand her new environment, Isabelle must look beyond the allegorical world of fairy tales, where characters are either good or evil, there is a clear moral, and everything is sorted in the end. In a subtle way, Dowell also addresses the disease of entitlement. For beyond having a more complex understanding, Isabelle must then choose whether or not to act. Even in an alternate universe, she learns life is not handed to you on a platter. You still have to get up off the couch, or toadstool, as it were, and do what you can do.